Ages 13 through adult. Here is a book that you can use to stimulate language production as clients define words, categorize words, and use language functionally for various communication purposes. 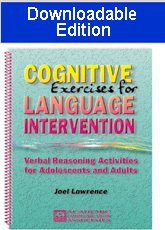 The language activities provide clients with practice in using a variety of cognitive strategies as they make comparisons, describe relationships, associate cause and effect, solve problems, share opinions, and so forth. The lessons will be especially useful with brain-injured clients and clients with language learning disabilities.